Last week I went to see Planet Computers to check on the progress of their second iteration of the Gemini phone, which we covered here and here. 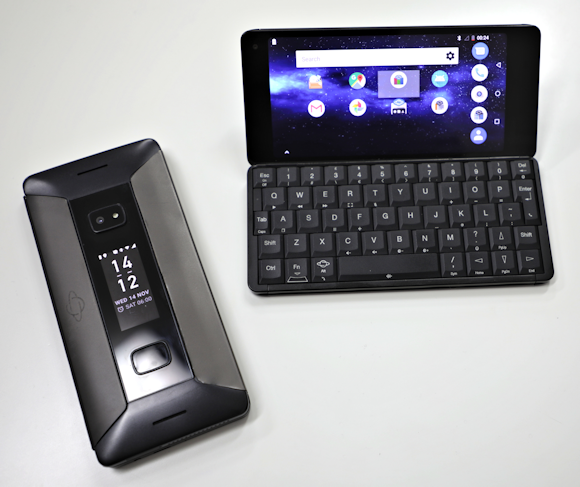 The new device, called the Cosmo Communicator, looks very similar to the Gemini, with a full qwerty keyboard beneath a six-inch 18:9 screen. It also sports a two-inch touch screen on the outside case. This makes it much more useful when closed than the Gemini, which was effectively "dumb", despite a row of clever indicator LEDs on the lid. Planet Computers has opted to run the external screen separately from the innards. It uses an STM32 microcontroller that interfaces with the Android-powered main unit to display calls, messages and contacts, among other functions. There's also an external fingerprint reader and a 24-megapixel camera, two elements that its older sibling lacks. The device is being initially backed through an Indiegogo crowd-funding project, like its predecessor (I'm a backer of both projects). However, Planet Computers has secured distribution deals with the top five retailers of consumer electronics in Japan, the device's primary market. Although the Gemini and Cosmo have been well-received in Western markets, with sales and orders in the tens of thousands, Planet Computers has been unable to break into the distribution channels that would ensure wider exposure and sales an order of magnitude larger. I was also shown Oxi, from French software outfit Auxens. Oxi is a desktop environment for Android devices that runs applications in windowed mode. Coupled with a monitor, keyboard and mouse, it becomes a potential replacement for a laptop, similar to Samsung's DeX solution. Planet Computers intends to offer Oxi to Gemini and Cosmo owners, making the diminutive devices an attractive alternative to bulky PCs. Oxi will be made available for Gemini and Cosmo devices with Planet Computers' proprietary HDMI cable "soon". Finally, in keeping with the company's principle of offering alternatives to the mainstream, it has announced that Jolla's Sailfish X operating system is officially available for the Gemini as a €30 download. The recent rise in "tech nationalism" has prompted greater interest in software, hardware and computing systems free from certain influences, be they Chinese, Russian or US. Offering a platform that is compatible with, but distinct from, Google's Android may increase the appeal of Sailfish to those seeking to distance themselves from the US tech giant. Planet Computers' initial gamble on offering something different in the sea of smartphone sameness paid off. The Cosmo will determine whether the success of the Gemini was merely nostalgia for a largely forgotten era of mobile computing, or proof that not everyone wants the same phone running the same operating system.